Google probably deals with this on a daily basis but when hearing that Thomas Hawk, someone who has 3.9 million circlers on Google+, it strikes a person as odd. His work is widely regarded and having someone with that many followers and high quality postings on Google+ have something taken down is very questionable. it’s probably automated. if x number of people flag a post as offensive it automatically gets taken down. But that system invites abuse. It invites people to gang up on photos that they don’t like that conform to the guidelines and have them taken down. I also believe that his explanation is how the system works with Google+, because of the massive size of Google+ it is probably an automated system. After so many people flagging content it is probably blocked just due to fact so many people report it. Like Thomas stated, this opens up for a group of people to get together and report a post to get it taken down if it doesn’t appease them, even if the work is within the bounds of policy. 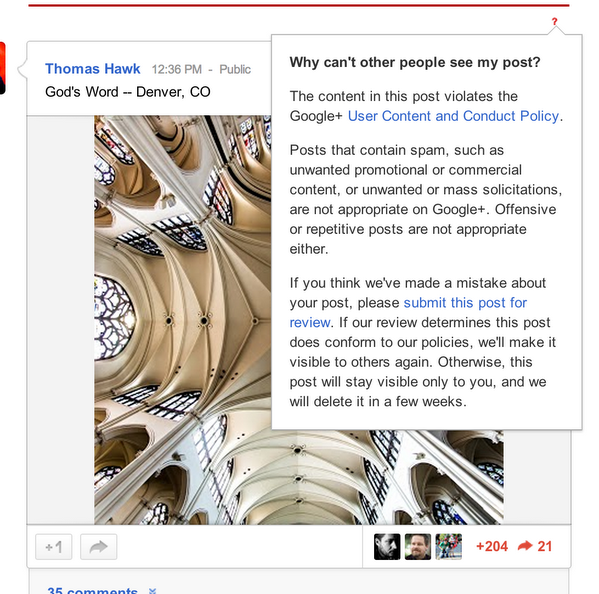 This is what I think happened to Thomas’s post, his work was taken inside of a church it looks like and the title of the post, “God’s Word” may have offended some people who ended up blocking the post. this shouldn’t have been the case of course, his work is original and his title choice wasn’t entirely provocative. I’m sure that with his follower count and outreach to the community the post will be put back up. Google does offer a review process if you think that the post was wrongly blocked. UPDATE: Since the posting, his work has been put back up. Still with no clear reason why.